As featured in The Daily News Egypt. I will never run after donuts, long for frosting or fantasize about a smooth square of chocolate coating my tongue with its melted magic. Shiny black olives, bubbling cheese, crunchy pickled carrots and crusty bread smeared with salted butter — this is what I crave. On naughty days, my leering appetite lends itself to crispy potato chips and thirst-inducing mixed nuts. My sweet tooth is not so sweet after all. When I left Cairo four years ago, there were two main brands of potato chips on the market: one that had been around for as long as I can remember and whose name has become as generic in Egypt as using “Kleenex” in place of tissue. The other was entering the monopolized market hoping to satisfy if only a small percentage of the Egyptian people's hunger for cheap snacks. Of course, there were others as well that would appear one day and disappear the next but due to their lack of availability I've chosen to disregard them. Today, walk into any supermarket and look for a bag of Egyptian chips. A large number of brands will be waiting to greet you, to entice you with their colors and cartoonish food images. You'll find the spicy ones, the not-so-spicy ones, the cheesy ones and the plain old salty option. There are thick ones, thin ones, crinkle-cut ones, puffy ones, and ones made with powdered potatoes. They all share one common trait: the level of secrecy involved in the ingredients used. Conduct an experiment: pick up three different Egyptian brands of chips (because most of us indulge anyway regardless of the mysterious nature of what we're devouring). Read the ingredient label and begin to ask questions. I've found that the ingredients listed are usually as follows: fresh potatoes, vegetable oil, salt and so-and-so flavor. That is it. There are over 100 types of vegetable oil and at least 11 of them are major oils used worldwide. So which oil is it and how processed is the oil they're using? Is it a blend or is it one type of vegetable oil? Do they add an anti-oxidizing agent (sulfites that can trigger an allergy or asthma attack) to prevent rancidity? And it’s only the oil that we’re now discussing. What about the potatoes? Have they been stored and treated with chemicals to improve color? Oh my. Why do we forget to think of these things, Egypt? After potato chips are fried, they're usually passed through a drum that coats them with powdered seasonings. Artificial seasonings? I'm sorry, the text on the chips pack doesn't clarify. How can I “Buy Egyptian” when I don't know what's in my food? Why should I “Buy Egyptian” when I cannot foretell if my child, my guest, the person I am feeding, will get an allergic reaction because I was not told the truth? Why are we progressing on the surface level alone? Since we cannot control the food industry and what they are disguising behind friendly commercials with catchy beats, I only ask you to start reading the ingredient label while you're munching on that snack. Question what is in local products and most importantly, have breakfast. I've found that the only thing that limits multiple bad-for-you cravings throughout the day is indulging in a proper breakfast. You won't reach out for the mixed nuts or the salty chips by noon and the chocolate pangs might never come. Buy Egyptian, not processed Egyptian but real Egyptian food: fruit, vegetables, eggs, cheese. I don't know about you but I'd rather eat real cheese than bulk up on empty calories from cheese-flavored powder. Preheat the oven to 220 degrees Celsius. Slice off the top of each tomato. Using a sharp knife, carefully carve around the inside of each tomato and remove the pulp and seeds. Place the tomatoes in a shallow oven-proof baking dish, with or without the tops. If your tomatoes don't stand upright, you can lean them against the sides of the baking dish. This allows the egg to stay centered as well. Depending on the size of the tomatoes you use, layer the white cheddar and gruyere cheese at the bottom. Over the cheese, sprinkle some fresh thyme leaves. Crack one egg into each tomato cavity. The trick is to keep all the egg whites contained in the tomato with minimal leakage. Do this slowly and don't rush it. 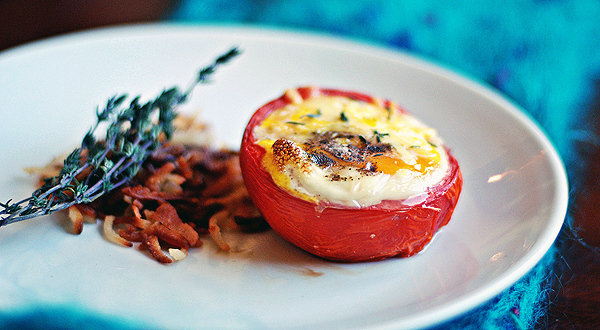 Bake your egg in a tomato for 10 minutes. By this time, they will begin to set. After 10 minutes, slide your oven rack carrying your baking dish out and sprinkle with roumy cheese. Push it back into the oven and bake for another 7-10 minutes or until the eggs are set to your liking. Remove the eggs from the oven and allow them to rest for two minutes. Remove from the baking dish and sprinkle with salt and pepper then garnish with fresh thyme. Serve. Hey there Sarah! i been following ur blog for many months now, the reply you gave to anonymous person was fantastic... never got to write to you, my studies has been keeping me so much occupied, just wanted to let you know how much i enjoy reading your post and drool over your pictures! and tomato cups gorgeous!